Watch the video. Guess the secret. Win £100. As part of our Savings Challenge campaign, Arnold Clark staff have been doing a series of bizarre tasks - a different #SecretChallenge every few days. The result of our final challenge is a secret... but if you guess it correctly on Twitter or Facebook, you could win £100 of high street vouchers. HOW MANY ATTEMPTS DID IT TAKE US TO KICK A FOOTBALL INTO A CAR BOOT? One St Johnstone player (out of 23) managed to get the ball in. But how many attempts did the Arnold Clark staff make?! 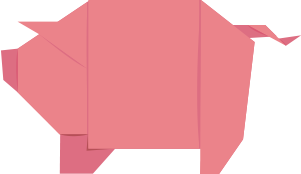 Guess our secret on Twitter or Facebook and you could win £100 of high street vouchers. HOW QUICKLY CAN WE DO A LAP ON A SCOOTER? Our Alan whizzed round the course in just 35.61 seconds. Well done Liz Stewart Adi for guessing 36 seconds - you were closest and won £100 of shopping vouchers! HOW MANY BALLOONS CAN WE FIT INTO A HYUNDAI I40? We managed to fit 182 balloons into the Hyundai. Congratulations to Robert Macgregor who guessed 186 and was the closest - he's won £100 of shopping vouchers! How many sheets of newspaper will we need to wrap a Jeep Grand Cherokee? 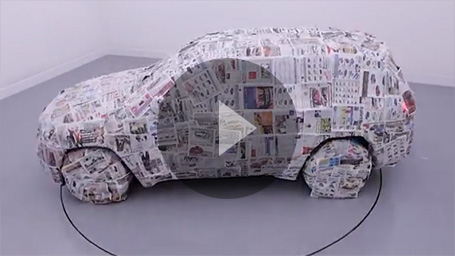 Our team used 188 sheets of newspaper from the Road Record to wrap the car. Well done to Jess Woodruff who guessed 189 (so close!) and has won £100 of shopping vouchers! 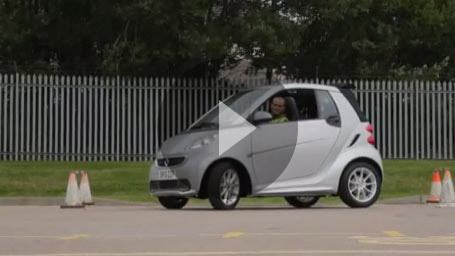 How small a space can we park a Smart car in? We were very impressed with our Lauren, who managed to squeeze the smart car into a 330cm (130") space. Well done to Tommy on Twitter who had the closest guess - 320cm. He has won £100 of high street vouchers! 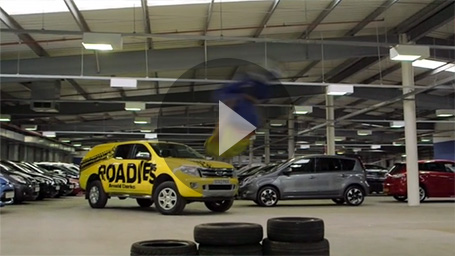 How many tyres can our Street Monkeys jump over? They managed to clear 12 tyres with their impressive acrobatics! Well done to Michael Byrne on Facebook who got it right and won £100 high street vouchers! 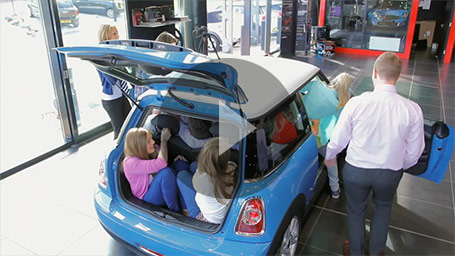 How many people can we squeeze into a MINI? We managed 14 Arnold Clark staff members. Well done to Neil Shillan on Twitter who guessed correctly - he won £100 Love2Shop vouchers! The Arnold Clark Savings Challenge encourages customers to visit their local branch and challenge their salesman to save them money. 8/10 customers will save money on their motoring costs, with an average saving of £50.90 a month.